PickupHockey.com - Boston - Well, now what? Obviously not if you are a Leaf fan. I guess you want a limited amount of really young, gifted talent with loads of potential to avoid the problem of having to sign all that talent. I guess it's better to trade off all of your draft picks for a single player because it's far easier to keep that one guys and let your competition reap the benefits of not only your draft picks but their own as well. Yep, smart hockey management at it's finest. Wow, have a hate-on much? This thread is about the Boston Bruins, you do realise that, right? Please keep it on topic. Ya Guest, I watched the whole game VS Philly. Back and forth, winning teqam changed hands 4 different times ! Good to see Savvy getting better every game, but, the guy at the hotdog stand could've scored at either end, was getting silly. That being said, B's are on a mini roll, hope they can keep it going. Does anyone know where Steven Kampfer came from? I never heard of him, but, damn has he got game !! was good for my pools though, I have a lot of BOS and PHI players but neither goalie. Absolutely correct. I was nowhere near satisfied with the game at all. But, I was very happy with the B's not giving in and fighting for every inch of ice. Like I stated starting this thread, jeckyl or hyde? I'm just happy for the 2 points and the team stringing together a few wins. I'm sure something will happen by deadline, but, I also thought so last year as well. Beans, Boston already used the 2nd round pick they got from the Leafs last draft. Draft season with only 29 picks?? are you refering to the devils pick? Yep, the assumption is the league will enforce the 1st round draft pick penalty this season meaning there will only be 29 picks in the first round. I was also unaware that Boston had the 2nd round pick in 2010. I thought it was the 2011 draft when Boston got the 1st and 2nd round picks. You are correct. Boston used the 2nd round pick to select a kid named Jared Knight. SO, to this point it is Phil Kessel for Tyler Seguin, Jared Knight, and a top 5 pick in 2011. Beans doesn't Jersey have the option over the course of the next 2 - 4 yrs to eliminate which 1st round pick they choose to forfeit or is it automatically the nhl's choice? If such is the case then i eliminate my previous statement in another thread that jersey was in much better position then the leafs. I was under the impression they would recieve the first pick overall presuming they continue their wretched play this yr and then forfeit next or the following yrs pick. it is NJ's choice on what year they give up the first round pick, in one of the next 4. 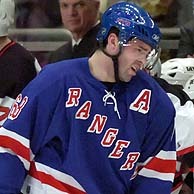 If the NHL mandated that it was this year, then that makes the Kovy signing all that much worse. From everything i've heard, the Devil's have the choice of which year they forfeit the pick. If anyone knows for sure otherwise, i'd love to hear about it cuz yeah, that Kovy signing would be even worse! Looks like Savvy's season, if not career could be over. 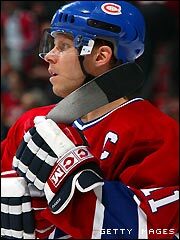 He took quite a nasty hit against the glass with his face, courtesy of one of our own that we traded to Colorado, Matt Hunwick. Testing will happen today, but, the history is getting long with Savvy and he might just have to make some hard decisions. Minimum of him sitting to after the All Star break. Toxxy i didn't see the hit and have been at work all night how was it? was their a penalty on the play or was it just bad luck for Savard? I personally hope that Savard has the same type of career that Lindros had. And ya. I have no doubt that Seguin is going to be good. But there is no guarantee that he wont be injured or will turn out to be the best player on your team either. And the same goes for Kessel for us. I am not commenting on anyone else's post. Just a thought of my own. I would like to see Boston win the NE Div. and lose in the first round to the Habs. It was a clean hit, unfortunate for Savard to be leaning in along the boards in the corner. Hunwick can throw 'em with the best of 'em and got all of Savvy, No penalty as it was a clean hit. I see you're still not over it? As I said in an earlier post, I have no issues agreeing on Savard's condition, but to wish a career ender? Harsh.... And Seguin wasn't even mention AT ALL? Yeah, T-RAV - I have to pile in here on you and say that wishing that Savard's career has ended in concussion is pretty tasteless, and morally unbecoming of someone who espouses any sort of morality. As with a player who has been seriously concussed previously, another concussion always happens much more easily. I had argued at length about not getting Savard just because of this back in the day, and had a long discussion about Savard being a high-risk (others on this very forum argued against me, saying it's just "one concussion"). This is one of those cases where I certainly take no pride whatsoever in being correct in my predictions. Hopefully, Savard recovers, but it certainly looks grim. about Savard being a high-risk (others on this very forum argued against me, saying it's just "one concussion"). Good call Slozo as this was Savard's 4th "documented " conc. And, digging a little deeper I found out there probably was as many as 4 more not documented. Ha ha, funny stuff . . . especially considering that Rask never played one game fro Toronto, as he constantly mentions whenever interviewed about this crap. He was traded as a prospect, and good for him - he has flourished. Oh, and to get back on topic: the Bruins are going to be just fine unfortunately, they will finish well ahead of Montreal, and the meltdown is currently happening RIGHT NOW (for the Habs). Yep, some meltdown. 7-1-2 in their last 10 games. Points in 9 of their last 10 games. What a total colapse. Seriously Slozo, are you losing grasp on reality in your rush to denigrate the Habs? I noticed you avoided my point as well about their apparently terrible rank #3 defense. Now that Savard is sidelined, maybe, just maybe Julien gives Seguin more than 8 minutes a game now that a centre spot is open? Well, when he goes on the IR, it'll open some cash for the trade deadline.... unfortunately. Here ya go: Obviously not if you are a Leaf fan. I guess you want a limited amount of really young, gifted talent with loads of potential to avoid the problem of having to sign all that talent. I guess it's better to trade off all of your draft picks for a single player because it's far easier to keep that one guys and let your competition reap the benefits of not only your draft picks but their own as well. I actually found several paragraphs about the Leafs. Let me know if you need any other help! This thread is about the Boston Bruins - period. How well they will do this year, where they will finish. Yes, Montreal is probably relevent to mention, since they have been close to top spot as well in the division, so it matters how well they do too . . . but let's not lose sight of the actual subject matter - the Boston Bruins. I would rather find out how Boston fans think their team will do without Savard for what looks like the rest of the year . . . it's a big blow, and it almost makes me think they might try picking someone up at the deadline. Did I mention this thread is about Boston? Boston will be ok without Savard as they went 23 games in without him and they are thick at centre. I would think if they make a move at deadline time, it would be for a puck moving Dman. As I posted in another forum, it seems that Kabby is off the trade market so it won't be him. With Savard going on the IR for the remainder of the season, Boston has some cash freed up to do some sort of move, but, Chia's history so far at deadline is to sit on his hands, so i'm not holding my breath. Stuart has been a healthy scratch since he came back from a broken hand, maybe he's on the move.